Test your shooting skills at an old fashioned shoot out as you shoot out the teeth of our friendly cowboys. Two players compete with paintball guns equipped with a barrell that shoots safe foam Bazooka Balls. The Base price is for up to 4 hours. Each additional hour is $25.00 per hour. 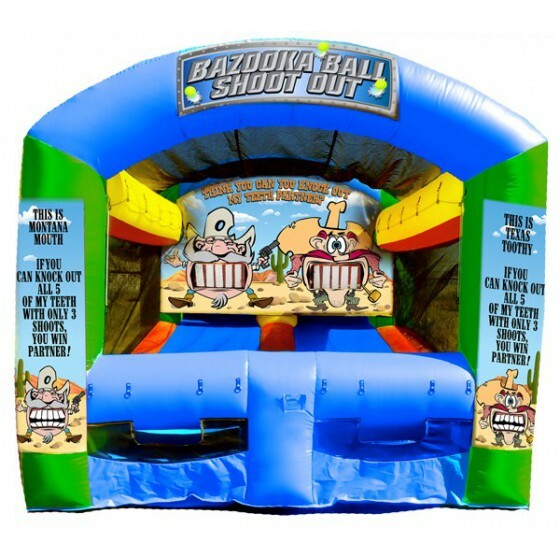 This fun inflatable shooting gallery is 18 feet deep by 12 feet wide by 11 feet hight. It requires a space that is 25 feet deep by 14 feet wide by 12 feet high. A 15amp circuit with nothing running on it is required to be located within 75 feet of the set up location. Delivery is free within 15 miles of our location, each way. Each additional mile is 75 cents a mile each way. 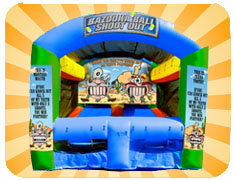 This inflatable can be set up on grass, a drive way, school black top, or inside a gym. A regular 15 amp circuit is equired with nothing else running on it. Normally, your back yard outlet will work fine! The bounce house must be plugged into the power source at all times during operation. For instances where power is not available, we have generators available for rental.